It’s been a few weeks since we’ve posted anything, but we’re back with a gallery of covers from Battle Aces magazine. 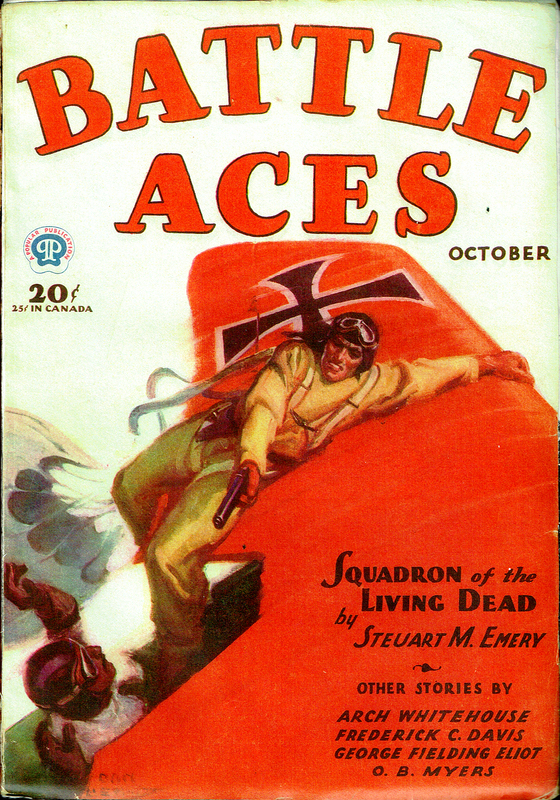 Battle Aces was Popular Publication’s premiere aviation pulp debuting in October 1930 as one of Popular’s first four pulp magazines along with Gang World, Detective Action, and Western Rangers. Unlike other Popular Publications aviation titles, Frederick Blakeslee did not paint all the covers! Don Hewitt provides the first cover, October 1930; with Rudolph Belarski doing honors for two early issues––November 1930 and January 1931; and Sidney Risenberg applying his talents for the February 1931 number. 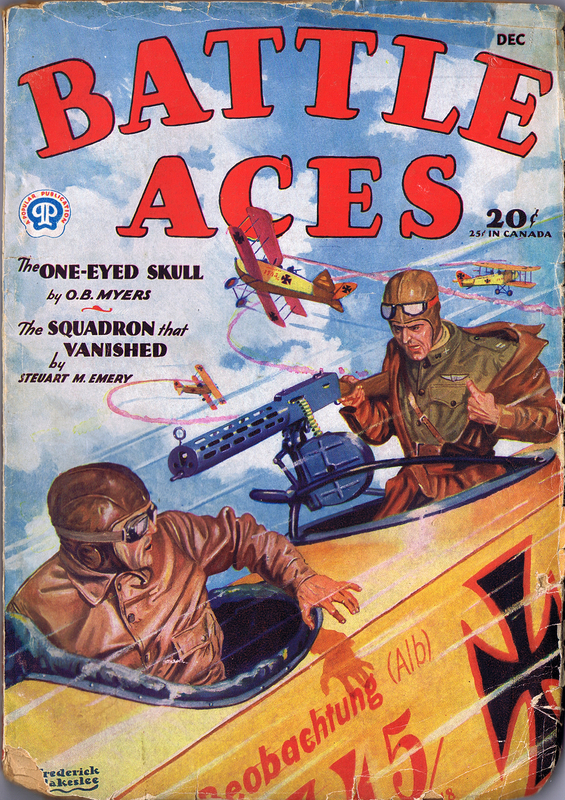 The December 1930 issue is Blakeslee’s first Popular aviation cover and he would take over the honors with the March 1931 issue and from then on for all Popular aviation titles–Dare-Devil Aces, Battle Birds, G-8 and his Battle Aces, etc. Stating with the June 1931 issue, an editorial decision was made to feature actual war-time events on the cover and artist Frederick Blakeslee would provide a story behind these covers. We’ve featured a number of those Battle Aces covers over the past year as part of the Story Behind the Cover feature. And we’ve provided links to those posts in the gallery so you can learn more about those covers we’ve featured. 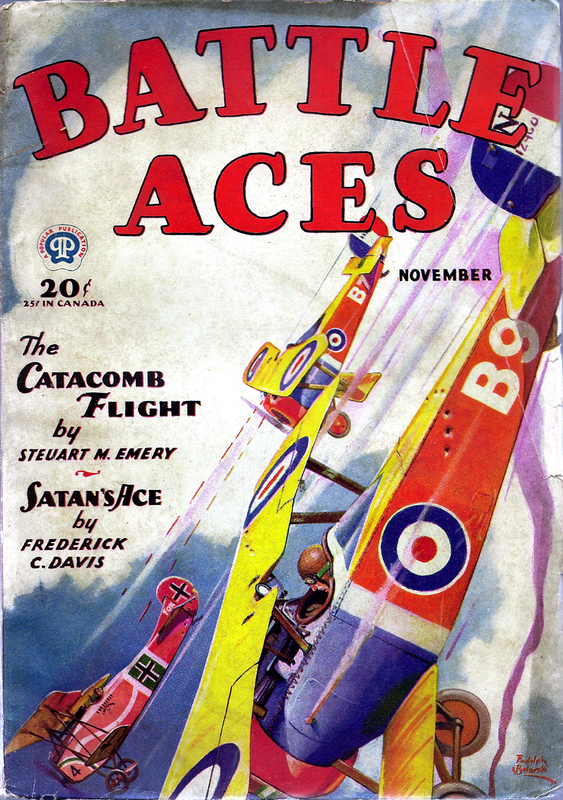 While we’re still building our Dare-Devil Aces Cover Gallery, The Battle Aces Cover Gallery collects all 27 covers and includes links to those whose stories we’ve posted. Check it out!